Gain in-depth knowledge of today’s East Asian societies and become a specialist in the most dynamic region of the world! Students gain expertise in East Asian contemporary history, politics and societies and learn social science research methods to become area specialists on East Asia. East Asian languages are studied as part of the degree to support students’ acquisition of knowledge and Master’s thesis research. Students in the Programme have good opportunities for student exchange in East Asian universities as well as to receive East Asian study and research scholarships. The Programme provides expertise to enter international public, private and third sector professions. Students also become qualified to apply to PhD programmes and to pursue an academic career. For a detailed description of the structure of the Programme, curriculum, and teaching, please see the Study Leaflet on programme webpage. 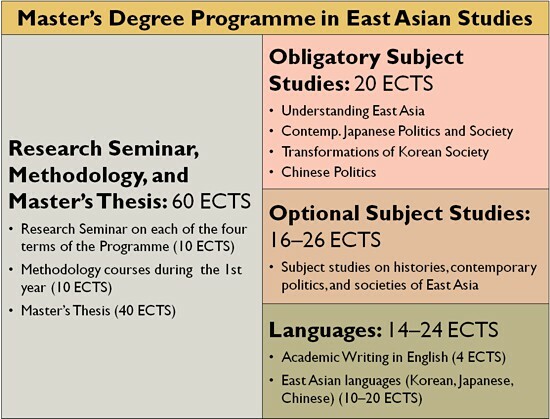 The Centre for East Asian Studies specializes in research on contemporary East Asian societies, with a special focus on various manifestations of civil societies in China, North and South Korea and Japan. For China, academic staff conducts research, for example, on disaster management, social movements and protest, urban governance, and environmental issues. For South Korea, on popular culture and social movements, as well as on South Korean foreign aid. For North Korea, on social and economic transformation. For Japan, on social movements and civil society. The research by the academic staff is directly reflected in the Master’s programme: students get up-to-date teaching on topical issues and societal and political developments in East Asian societies. Students also receive individual thesis supervision firmly anchored in the East Asia expertise of the teaching staff. Students conduct independent research on their chosen topic and write a Master’s Thesis (40 ECTS). This trains students to apply social science methods, carry out research, analyse research data, present their findings orally and in writing, be engaged in argumentation and debate, and communicate their research findings in accordance with scientific standards. Place and belonging – an ethnography of rural migrant children in Beijing. Cosmetic surgery and rites of passage in Korean society – a study on cosmetic surgeries after the university entrance exam. Remembering the war and aggression: a discourse analysis of Japan’s state apologies and commemoration speeches on August 15th, 1995–2015. From the Great Famine (1958–1962) to the food waste problem: the role of memory to enhance the awareness in the city of Shanghai. South Korean presidents and the alliance with the United States 1998‒2012: a case study of the Free Trade Agreement. Students in the Master’s Degree Programme in East Asian Studies have very good study exchange opportunities in the People’s Republic of China, Japan, South Korea, Taiwan, and Hong Kong, in the partner universities of the University of Turku. It is common that students spend one or even two academic terms abroad during their second year in the Programme and also conduct field research for their Master’s thesis during that time. Students of the Programme also have a chance to study for one year in the Master of China Studies programme at the Zhejiang University in China as part of their Master’s Programme in Turku. In this Master’s Degree Programme, you will gain in-depth knowledge of contemporary East Asian societies. communication, computer, and organizational skills. Those graduating from the Master’s Degree Programme in East Asian Studies find employment in public, private and third sector jobs, such as in diplomatic service, international organizations, and companies where knowledge on East Asia and dynamic regions is in demand. Graduates of the Programme are eligible to apply to the doctoral programmes at the University of Turku and other universities in the fields of social sciences and East Asian studies. A Bachelor’s degree that formally qualifies the applicant to access Master’s level studies in the country where it has been completed. This degree should correspond to at least 180 ECTS (European credits) or to a minimum of three years of full-time study. You must also prove your English language skills when applying. Please visit the website of the programme for more information. per academic year. Tuition fee for citizens of non-EU/EEA countries.